^ a b c 藤原, 敬介 (2013-03-30). “＜書評＞『ニューエクスプレス・ベンガル語』丹羽京子（著）,2011年,白水社.” (PDF). 印度民俗研究 12: 89-108. http://hdl.handle.net/11094/50057 2017年10月24日閲覧。. 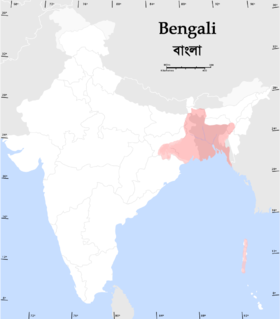 ^ a b c d e “Bengali language”. Encyclopaedia Britannica. (2017-07-28). 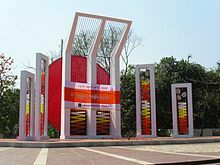 https://www.britannica.com/topic/Bengali-language 2017年10月16日閲覧。. ^ Oberlies, Thomas (2007). "Chapter Five: Aśokan Prakrit and Pāli". In Cardona, George; Jain, Danesh. The Indo-Aryan Languages. Routledge. p. 163. 978-1-135-79711-9. ^ http://hudsoncress.net/hudsoncress.org/html/library/history-travel/Eaton,%20Richard%20-%20The%20Rise%20of%20Islam%20and%20the%20Bengal%20Frontier.pdf Archived 2016年6月21日, at the Wayback Machine. ^ a b c d David, Anne Boyle (2015-06-16). Descriptive Grammar of Bangla. Walter de Gruyter GmbH & Co KG. pp. 354. ISBN 9781501500831. https://books.google.co.jp/books?id=_4UFCgAAQBAJ&printsec=frontcover&hl=ja&source=gbs_atb#v=onepage&q&f=false 2017年10月17日閲覧。. ^ Alexander, C (2011-06). “Making Bengali Brick Lane: claiming and contesting space in East London.”. the Brittish Journal of Sociology 62 (2): 201-220. doi:10.1111/j.1468-4446.2011.01361.x.. https://www.ncbi.nlm.nih.gov/pubmed/21631455 2017年10月17日閲覧。. ^ a b c d 大西, 正幸; ドゥルガ・ポド・ドット (2016). “ベンガル語の expressives をめぐって” (PDF). 言語記述論集 (Journal of Kijutsuken, Descriptive Linguistics Study Group) 8: 193-230. https://chikyu.repo.nii.ac.jp/?action=repository_action_common_download&item_id=953&item_no=1&attribute_id=22&file_no=1 2017年10月24日閲覧。.